Having problems exporting MS Word documents with images to PDF? There are several reasons why this can occur. Let’s look at different settings you can use to fix this and get a better PDF. Click File, Save As PDF. Click File, Export, Create PDF/XPS document. Each of these offers different options (and potential problems) when you convert the document to PDF. The most common problem is the image file format you are using in the Word document. Maybe you’re using different formats. Maybe you’ve cut and pasted from Snagit and don’t know what format they are. The type of image you import into Word may affect the PDF output. In other words, if you try different formats, you may get better results. Save or convert the image/s into PNG and then insert into Word. Save or convert the image/s into EPS and then insert into Word. Save or convert the image/s into JPEG and then insert into Word. Save As in PDF format. Open the Word 2013 document with the images inserted. Click File, Save As, and PDF from the drop-down menu. The Options button is displayed at the bottom of the window. 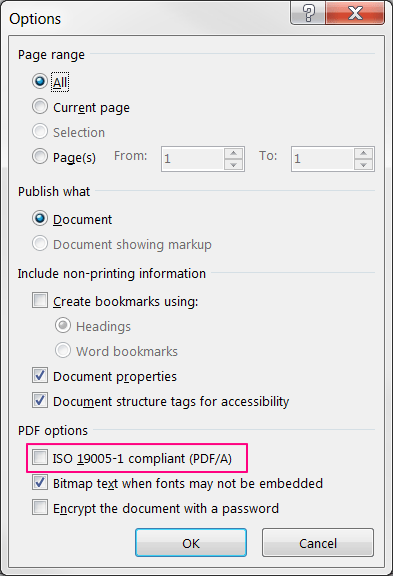 On the Options dialog box, select ISO 19005-1 complaint (PDF/A) in the PDF options section. Note: In some instances, unchecking the ISO19005-1 Compliant option seems to work. Does this resolve the issue? If not, try the following. By default, MS Word compress images. This can reduce the image quality when converting to PDF. Note: Turning off compression can cause very large file sizes without an upper limit on the file size. In Word, click File, Options. Click Advanced, scroll down to Image Size and Quality. Turn off Discard editing data. Select Do not compress images in file. Select Set default target output to 220 ppi. You can also change the PDF optimization settings. One thing that worked for me recently was to change from Minimum to Standard settings. Click File, Save As, then select PDF from the drop-down menu. Don’t click File, Save As Adobe PDF. At the bottom of the page, click the Standard button (publishing online and printing) instead of Minimum size (publishing online). In Word 2013 click on File, Options, Advanced. 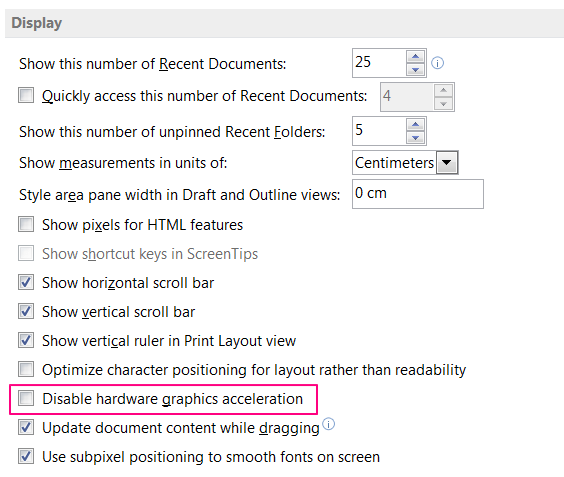 Under Display group of options, uncheck Disable hardware graphics acceleration.